Last year I interviewed Maria Engel, a graduate of Elmhurst School of Dance, a vocational school which is associated with the Birmingham Royal Ballet Company. At the time, Maria was performing with Ballet Theatre UK, touring around the UK with a new production of The Nutcracker. I reviewed the show last year and you can read it here. 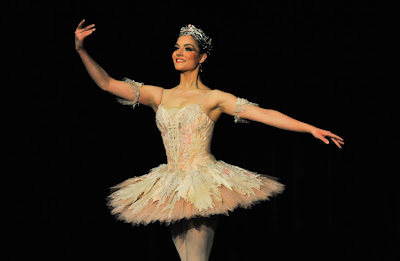 Maria danced the Principal role of the Sugar Plum Fairy, a role most dancers fear because in a traditional production you are suddenly on stage and exposed, with virtuoso steps and no time for the audience to get used to you, to great acclaim. Maria has a luminous stage presence, which I think you can see from these photographs, and her dancing is technically very strong with great acting ability, drama and passion. When she dances you are compelled to watch. She didn't have an easy time on tour - a different theatre every night with possibly a raked stage or a very hard one, long hours travelling, very short classes which didn't allow her the full range of a normal class and then possibly two shows per day. The company director told me that Maria was a pleasure to have on tour because throughout all of their difficulties - some unforseen (they were kept up all night by a rowdy gang outside their hotel) - Maria's sunny disposition beamed through. This touring experience is invaluable. Maria's latest achievement is to be awarded an honour from the county of Landsberg am Lech in Germany, which was in recognition of her success in graduating. The price money was €1250 and Maria danced at a gala evening where she performed Raymonda Act III, Sugar Plum Fairy and the Tango (choreographed for this gala by one of the teachers from Elmhurst). 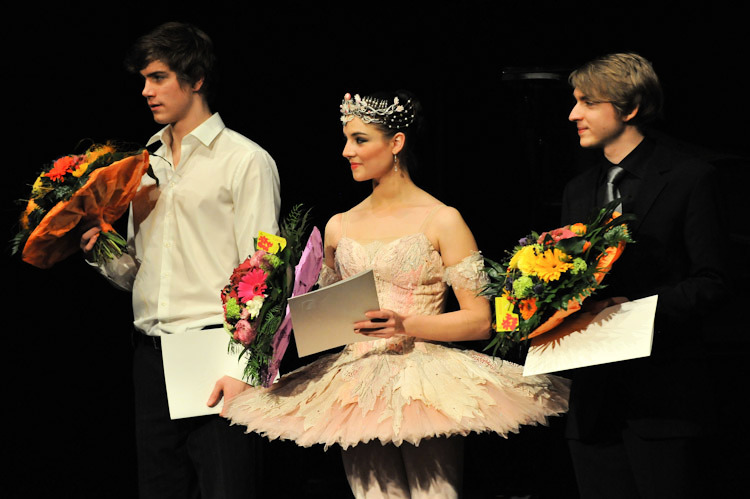 Maria's old ballet teacher, Beatrix Klein, gave a speech which made Maria very emotional. Maria is one of a large number of professional dancers who find themselves auditioning for work all over the world. Often this means a long journey to the audition, only to be cut from class, with a tap on the shoulder - nothing more - at the very beginning (barre) section, perhaps only ten minutes into the audition. You can imagine how taxing this can be - and Maria is very young. Often they will receive little or no feedback from the company and are left to work out for themselves what went wrong or why they didn't fit with the company. It's a hard life; difficult to stay positive in the face of rejection, and Maria has shown resillience and determination which is not uncommon in professional dancers. Regular readers might recall Maria telling me in her interview that she studies the dancers in every company to see where her face might fit. As I type this Maria is still auditioning, having missed the English National Ballet auditions for their Swan Lake in-the-round due to a knee injury which is now healed. Maria wanted to do the audition anyway and not miss the chance, but as the accident happened in school, her teachers understandably vetoed it. One of her teachers enabled her to take Company class at English National Ballet recently, and Maria loved "every split second." Perhaps the Company will like her enough to ask her be part of it at some stage. I'm sure you will all agree with me that Maria is due some luck, some reward for her hard work and resourcefulness, supporting herself away from home, and I hope that this feature will help to secure her a coveted Company contract. One of the things Maria likes so much at Elmhurst is the friendly atmosphere, and I have experienced the same openness and friendly, welcoming atmosphere at English National Ballet, so there does seem to be a correlation there and it's not surprising that Maria enjoyed the experience so much. Maria is lucky in that she was invited to take classes at Elmhurst beyond graduation; many graduates from other schools are not so fortunate and have to find suitable teachers/classes and take extra work to pay for them. Of course, the competition is very tough and there is no shortage of dancers looking for contracts. It's a pyramid really, with a very, very wide base, and to reach the pinnacle and their goal - a company contract - a certain degree of luck is also needed. Where you train also helps; for example if you train at the Royal Ballet Upper School, going on current records, you are guaranteed a contract with a Company somewhere around the world. Although, even then, only a tiny percentage of the graduate year will make it into the Royal Ballet Company itself - the logical conclusion. all these girls amaze me at how beautiful they are and they dont even know it or act like it . thanks for the post . It's very interesting to read this amount of detail on the difficulties of a young dancer getting established, even when they are very talented. I hope she gets a contract soon, & congratulate her on her well-earned prize. It's also nice to be appreciated by one's own country when one works abroad. She looks wonderful, I hope I will have a chance to see her one day..
Oh, another stunning creature! My daughter and I saw the dance company "Rioult" on Saturday and if you ever want to do an interview with a guest dancer "Maxine Sherman" - she lives locally and has a studio called "e-tone"
Congrats to Maria for getting the well deserved award! The life of a dancer who performs worldwide is not easy. It seems, however, that Maria has been blessed with the gift of adjusting herself perfectly to any stage, any place. I wish her endless success in her career! Their moves are breath taking! WOW! I was just thinking about what you said about the fear of dancing as the Sugar Plum Fairy and it's so true. I'd never thought of that before, but you're right! What a wonderful Post! I love the images. Maria is so graceful. You can just tell how much she loves to dance. That is so great and she looks amazing! Love it! Great quote! Do you take much of the photos or do the dancers supply them? I always love the variety and it adds so beautifully to your articles. Hope you are well. Blessings. So glad she is getting the recognition she so well-deserves! And her costumes are so beautiful. Anne - thank you. Not much is said about the vast numbers of trained dancers who can't get work, and after so many years of hard training, none of them want to give up or be told that it's time to try something new. Every year more graduates search for work, joining those from previous years who travel the world auditioning for work to hold onto their dream. pve design - thank you - sounds intriguing ! DUTA - well, Maria needs a lot of luck right now. Cafe Fashionista - it's true; though a contract is the real reward Maria is looking for ! Wise Take - thank you, glad to help ! Such a Wondrous Place this Faery Space - well, as a journalist I get most of the photographs from the press offices around the world, but sometimes other people supply them. Audrey Allure - thank you !